“Most Americans know more about their cell phone plans than they do about their health insurance,” Wisconsin Gov. 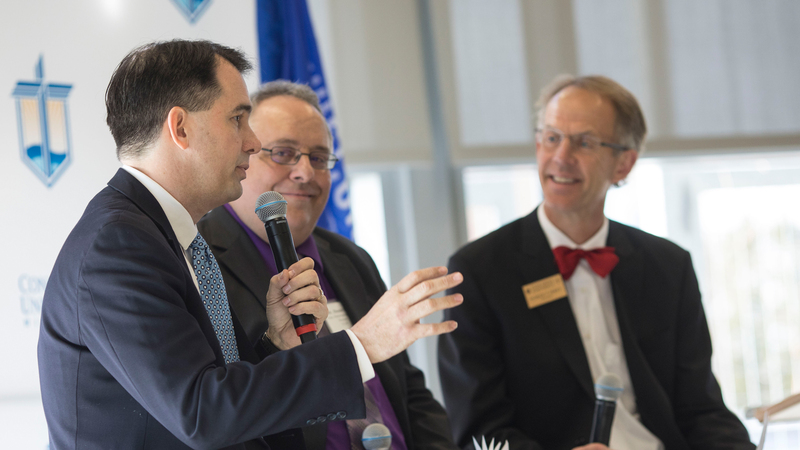 Scott Walker quipped on Tuesday, March 21, to an audience of about 150 leaders and innovators in the health care, business, public policy and higher education spheres. That needs to change, the governor asserted, and the answer starts with absolute transparency in medical pricing. 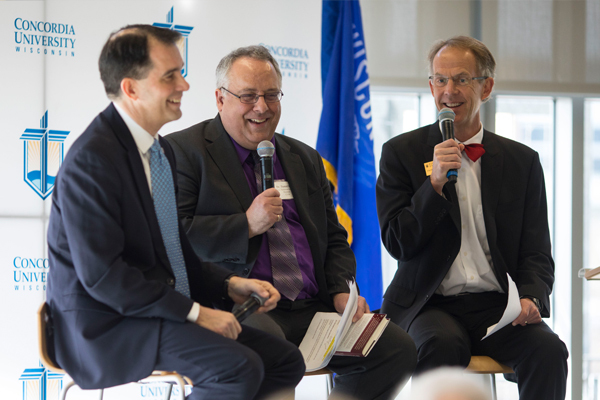 Market transparency was the theme of the Tuesday morning Healthcare Economics Summit: The Business of Healthcare, hosted by Concordia University Wisconsin. The summit is just one of the ways Concordia is demonstrating its leadership and interest in the topic of controlling health care costs. University leaders announced last fall plans to build a new academic building to house its Batterman School of Business and health sciences programs. The building will be a space where free enterprise solutions to the health care crisis may be explored and put into practice. The name of the building, which was announced as The Robert W. Plaster Free Enterprise Center at Tuesday’s event, reinforces Concordia’s commitment to help spur meaningful discussions on the subject and train future health care and business leaders to employ smart solutions in the workforce. Dr. Daniel Sem takes a good-natured jab at Gov. Scott Walker's Twitter activity. In addition to Gov. Walker, the Tuesday summit brought together an esteemed slate of speakers who illustrated the health care costs issue and who spoke about movement towards promising solutions. Instead, Torinus has moved Serigraph to a self-insured model. The company underwrites its own health care risks and in so doing, company executives have a greater incentive to manage their company’s risks, says Torinus. Eric Haberichter, co-founder and CEO of Access HealthNet, spoke about “restoring dignity and affordability to patients” by creating an open marketplace where consumers have complete transparency in medical pricing. Haberichter is making strides towards that end through Access HealthNet. The start-up is devoted to cutting health care costs for employers and employees by bundling medical care services, as he had done in his prior startup, Smart Choice MRI. Additional speakers included: Valley Elliehausen, a CUW alumna who, as COO of the West Bend School District, has successfully moved the district to a self-insured model; EVP and President of Aurora Health Care Medical Group Dr. Jeffrey Bahr, who spoke about how an integrated health care delivery model can provide higher quality care at a lower cost; and CUW alumnus and President of Mercy Medical Center (part of Ascension) Jeremy Normington-Slay, who echoed Bahr’s philosophy on an integrated model and shared how his Concordia experience helped prepare him for his current role. Gov. Walker, the featured keynote, fielded questions from Ferry and Concordia’s Batterman School of Business Dean Dr. Daniel Sem to start the event. Walker expressed his goals and desires for health care and Medicaid reform in Wisconsin, sharing lessons learned from faith and his own upbringing. The son of a pastor, Walker told how his father would welcome those in need into the church, asking that the individuals repay any monetary assistance given by helping out with chores around the parish. His father’s approach models his own approach to entitlement programs in many ways, Walker said. That’s a goal for Concordia’s free enterprise center as well, said Sem.